Colombia no longer deserves its reputation as a place that’s dangerous for foreigners. Rugged adventures reminiscent of the movie “Romancing the Stone” are part of this country’s allure, but Colombia is steadfastly becoming a safe destination for the risk averse too. One of the must-see places on the Caribbean is Colombia’s coastline, and one of the biggest tourist hubs there is Santa Marta. Santa Marta was actually one of the first cities to be founded in Colombia in 1525. Though the area was occupied by the native Tairona culture before that. Of course, the city is most popular for its beaches. A beautiful white sands, though heavily populated, beach stretches right along the city’s coastline. But as a hub, beautiful remote beaches are easily accessible not far from the city’s center. For instance, Tayrona National Natural Park is located only 34 km north of Santa Marta, which has camping zones, virgin beaches, ecotourism, and indigenous tribes. It is probably the most important ecological reserve in Colombia. The Mamancana Natural Reserve is also nearby, which offers the possibility to see wildlife and activities that might sound more attractive to the adventurous visitors to Colombia: paragliding, downhill, rock climbing, and canopying. 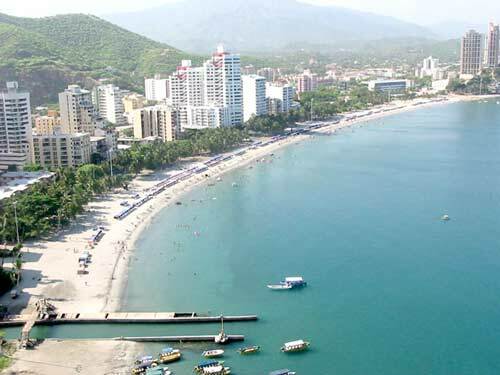 Other attractions of the area include Quebrada Valencia, a majestic waterfall emerging in the middle of the rain forest, Pueblito, also known as Cahirama, one of the 200 pre-Columbian cities discovered near Sierra Nevada de Santa Marta, and Taganga, an authentic fishing town and a great place for scuba diving and beautiful beaches. The city itself hosts a wide range of attractions too. There’s Quinta de San Pedro Alejandrino, which was built in the 17th century and was the last home of Simon Bolivar. A magnificent Cathedral, which actually held the remains of Bolivar until 1842, is also here. Sports fans moving here can also enjoy cheering for the city’s own professional soccer team, Unión Magdalena, nicknamed El ciclón bananero or “The Banana Cyclone”. All of this is just part of what may make Santa Marta one of the premiere destinations in South America! Hy nice plan, Santa Marta, Cartagena and Barranquilla. What beautiful beach in Santa Marta? I was there a few months ago (November 2010) and the beach is filthy. There’s no white sand whatsoever, and the water is really poluted (you can actually see it). The nicer beaches are in Tayrona Nationa Park. Santa Marta beaches are the best, shut up! Santa Marta is awesome – it’s got so many beaches – it’s crazy! There’s something for everyone. No doubt the best ones are in Tayrona Park. A must-see!